3 Months Compulsory Driver Warranty £150.00. Open the PDF To View Our Warranty. 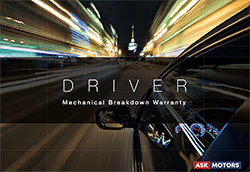 10 out of 10 service from Ask Motors. Fantastic selection of cars and the sales team are great, they assisted me throughout the whole car buying process and their service and expertise was second to none! Lovely place to purchase a car from with a variation of buying options, no pushy sales people and a friendly and clean environment. Would highly recommend and will definitely be returning!